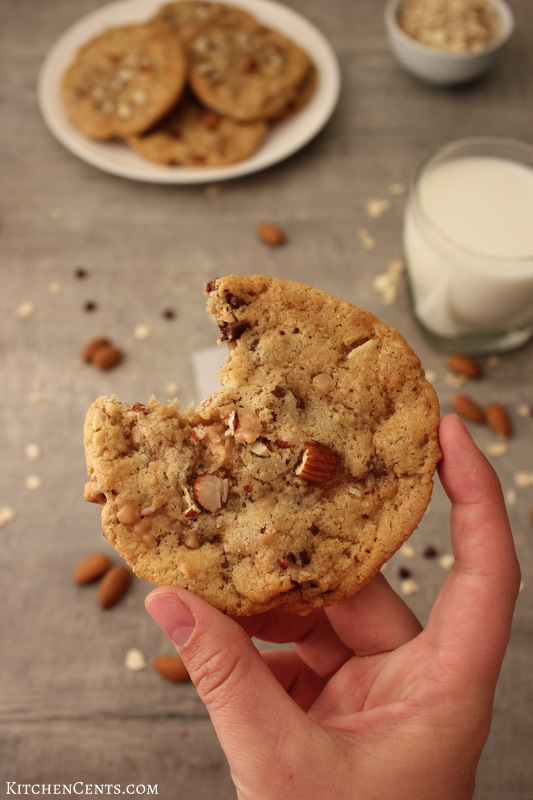 These soft and Chewy Toffee Almond Chocolate Chip Cookies are full of nutty almonds, buttery toffee, and sweet chocolate. You can whip up a batch of these delicious cookies in under 30 minutes. Bake them all or freeze for later, everyone will love them. 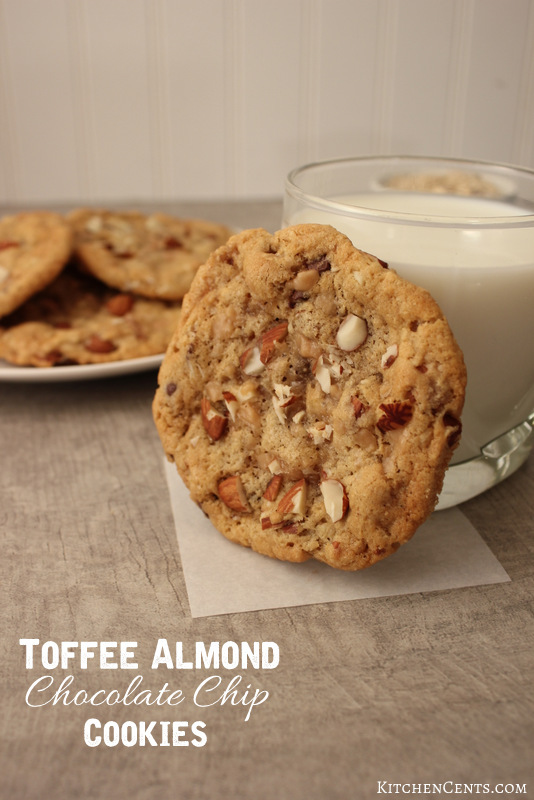 If you like English toffee with almonds, these cookies will become a new favorite! I have been offline for a week and it feels like I’ve missed so much. Easter has come and gone. I hope you all had a wonderful day! We’ve had yet another nasty respiratory bug go through our home. This time it hit me the hardest. I feel like my head might explode from the mucous in my sinuses. Not to mention the feeling that I might hack up a lung every time I cough. The last two days I have literally been flat in bed or on the couch, whichever was closest to the kids. With that said, I was hoping to get this post up last week but clearly, with the yuck going through my home, it didn’t happen. Thankfully, I’m here to share it today. 🙂 It’s a dang good one too. 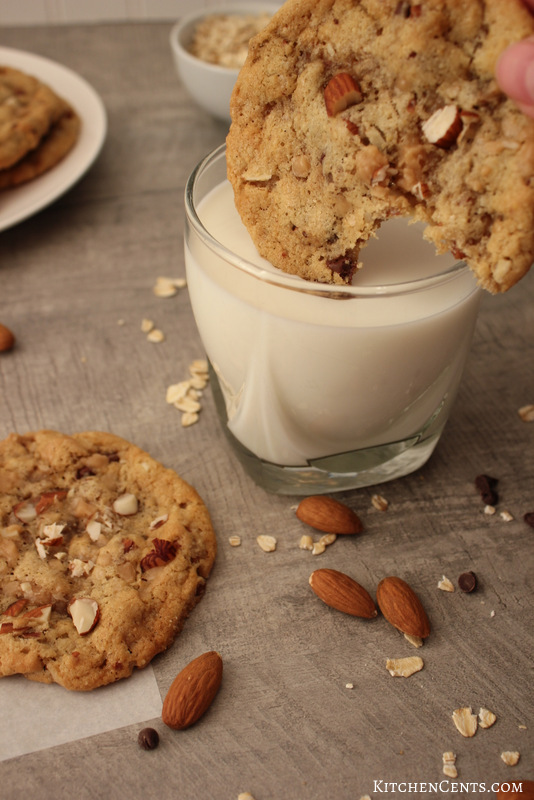 These chewy toffee almond chocolate chip cookies are so delicious! My family loves English toffee and this treat is just that with a little cookie twist. These cookies are so much more than another chocolate chip cookie! They are sweet, filled with toffee & almonds, and are soft & chewy. Although they are made in the same fashion as a traditional chocolate chip cookie, they are better. Just wait until you taste your first batch. I start by creaming the butter and sugar together. Once they are whipped and fluffy, I add the vanilla and eggs. This is the yummy cookie base. The ratio of flour (regular and oat) to sugar is what gives these cookies their chewy texture. Once those are well blended, I add the oat flour (oatmeal I have ground in my blender until it is the consistency of course flour), regular flour, baking soda, and salt. I mix these until they are just blended. Then I add the toffee, chocolate, and chopped almonds. From here I do one of two things. I either bake the whole batch (5-6 doz. 2-inch cookies) or bake part and freeze the rest. I love baking a sheet full for now and freezing the remaining dough for later use. It makes for a quick and easy treat on nights I don’t have a lot of time and is less expensive (and tastier) than store bought cookie dough. I love baking a sheet full for now and freezing the remaining dough for later use. It makes for a quick and easy treat on nights I don’t have a lot of time and is less expensive (and tastier) than store bought cookie dough. To freeze them, I scoop them out with a D20 ice cream scoop (I can make about 3 dozen cookies when I use this scoop). You could use whatever size you prefer. 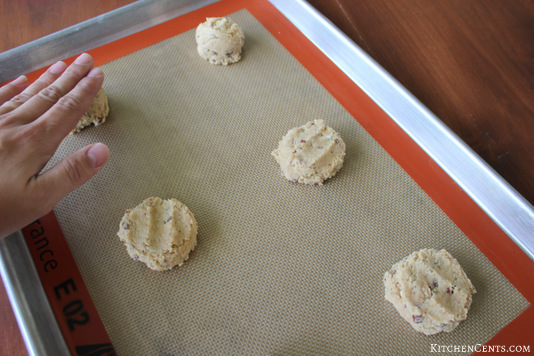 I fill a cookie sheet full then pop them in the freezer until they are frozen. Then I bag them in freezer Ziploc bags. If you’ve never frozen your own cookie dough, it’s time! When I bake them, I scoop them onto my cookie sheet. If I make large cookies (larger than 2 inches) I carefully press each cookie dough ball down then sprinkle them with nuts. Are you a cookie milk dunker? What’s your favorite kind of cookie?